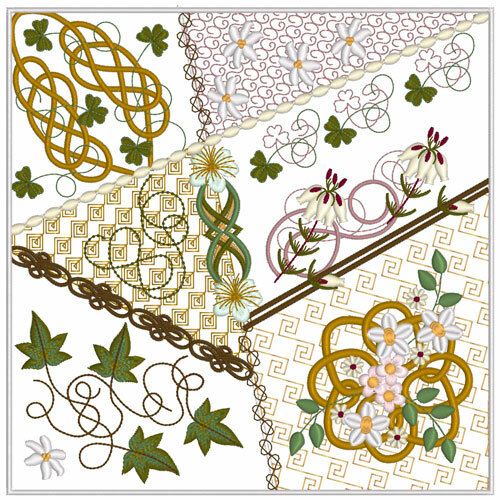 As Celtic embroidery fascinates me and I have several collections I thought it about time I created a crazy quilt block with a Celtic theme. 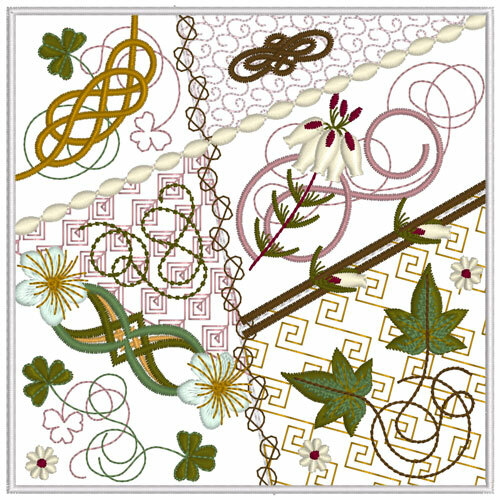 There are some new designs within this block and some elements from Holly Bells, Celtic Heather, Celtic Ivy and Celtic Grace. Here is the smaller block which is 5″ square. The larger block for the 8″ hoop follows the same structure of adding 3 pieces of fabric to the base fabric before the embroidery begins. I have discovered that these blocks stitch out very well on one layer of Sulky soft and sheer which results in a softer feel to the finished block rather than using two layers of stitch and tear which has been my previous practise. A little press of your iron on each fabric as it is folded back gives a better finish too but you will have to check that your iron fits inside the hoop without touching and damaging the edges. The block really should have a colour scheme based on greens, golds and browns with a tint of heather pink otherwise it will lose its Celtic flavour. Your choice of fabric is also crucial to how the finished block will look. 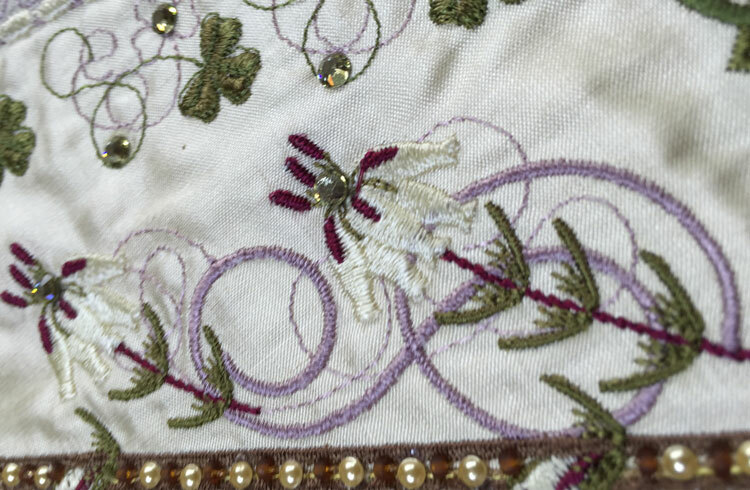 It is equally important to match the motif fill stitches to each fabric piece that they cover, that is the top right, middle left and bottom right blocks. My choice is to use a thread a few tones darker than the fabric. When the embroidery is finished remove it from the hoop and make sure that most of the underlying jump stitches are snipped so there is no pull on the embroidery. There really isn’t much backing on this embroidery that can be removed safely and I left it all in place. I pressed mine into a terry towel and then began the process of embellishing. Again you need to look for small buttons, motifs, sequins, crystals and silk ribbon which will continue the same colour scheme. If you prefer a more open block then you may want to edit out some of the embroidery in your embroidery software, or eliminate the motif fill stitches. 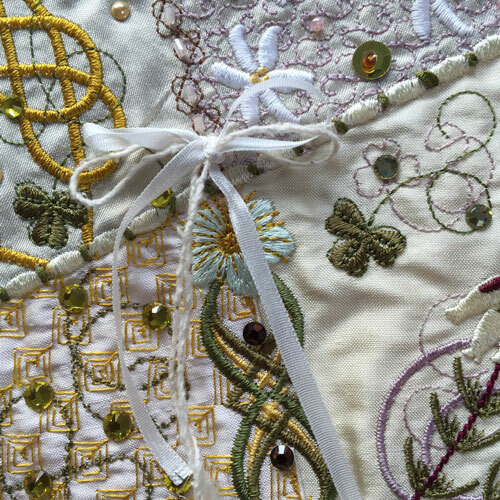 As you create more and more crazy quilt blocks you will find intriguing ways to personalise and embellish them. There are also many images on the internet if you need some inspiration for the embellishment. 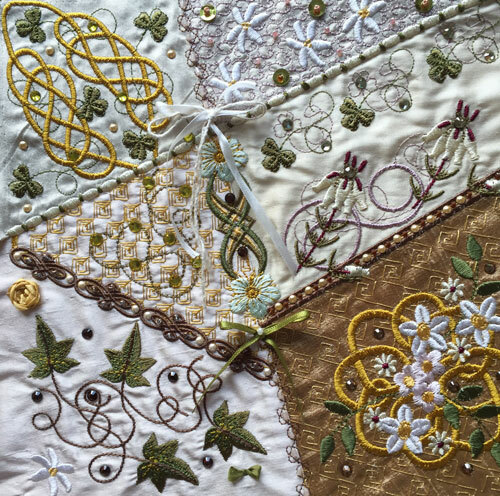 When it comes to deciding how to embellish the block I collect all the suitable notions and lay them around the embroidery to check firstly if the colours are correct. I am sure that there is no correct way to embellish but choosing the best items to compliment your work is vital. 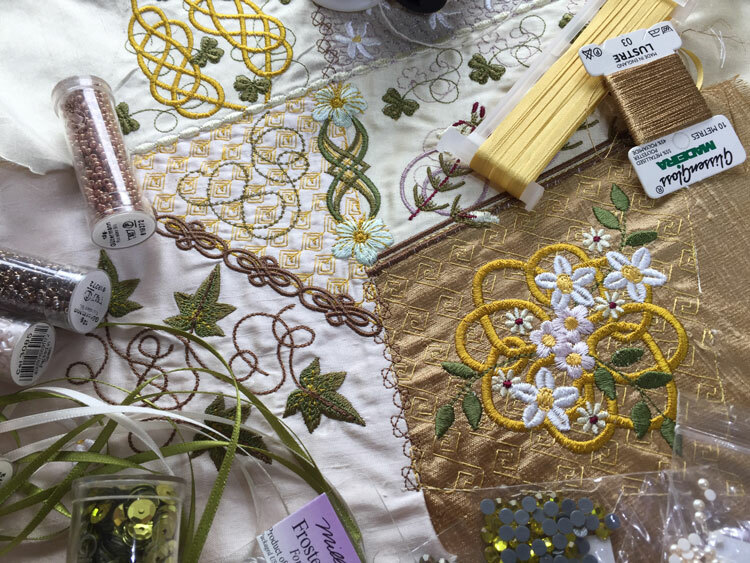 At this point it is a good time to refresh your memory by referring to any Silk ribbon embroidery books to see if there are any perfect stitches to enhance the embroidery. Mine are on my iPad in the Kindle app which makes it so easy to view them while I am sewing. My favourite is the A to Z of Ribbon Embroidery by Search Press. 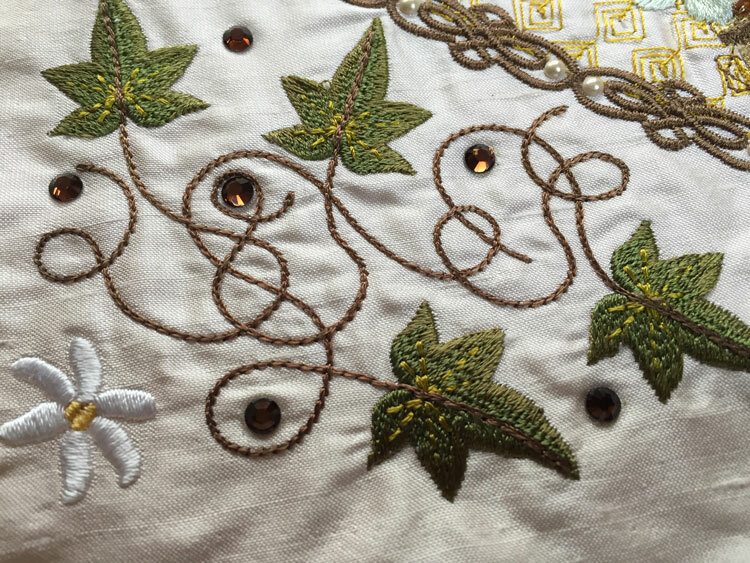 I had difficulty finding any suitable buttons or charms for this block with a Celtic theme, and as it is quite a busy embroidery decided that they were probably not needed. However if you know of some great places online to buy such things do let me know as I am always on the look out for them now I am an ardent crazy quilter! 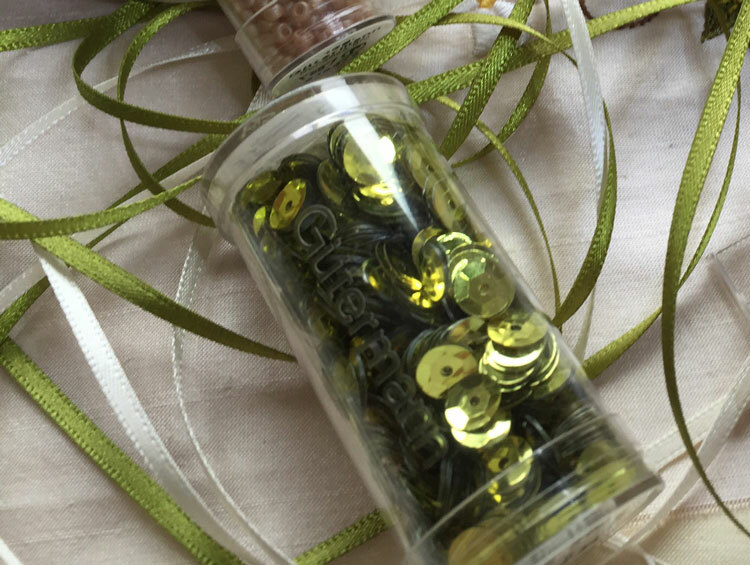 My favourite items that I discovered with the beautiful green sequins and ribbon shown below. I decided to attach the sequins first with a small coffee coloured bead in the top right area. 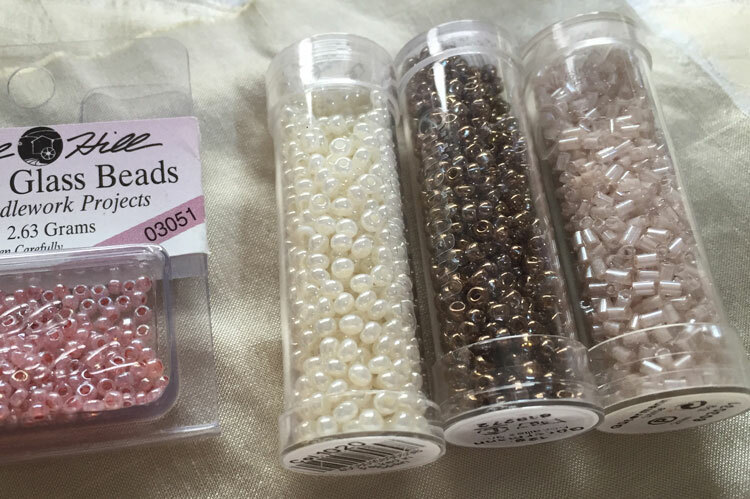 Then I attached a row of seed beads between the two brown bands below the heather, leaving room for some hot fix pearls. Once this was done I started adding my hot fix crystals and pearls filling in gaps and placing them at the end of running stitches. Brown crystals worked well around the ivy leaves and I attached tiny pearls in the brown border above. You can see the pearls that fill in between the pearls and some lovely pale green crystals that highlight the heather. 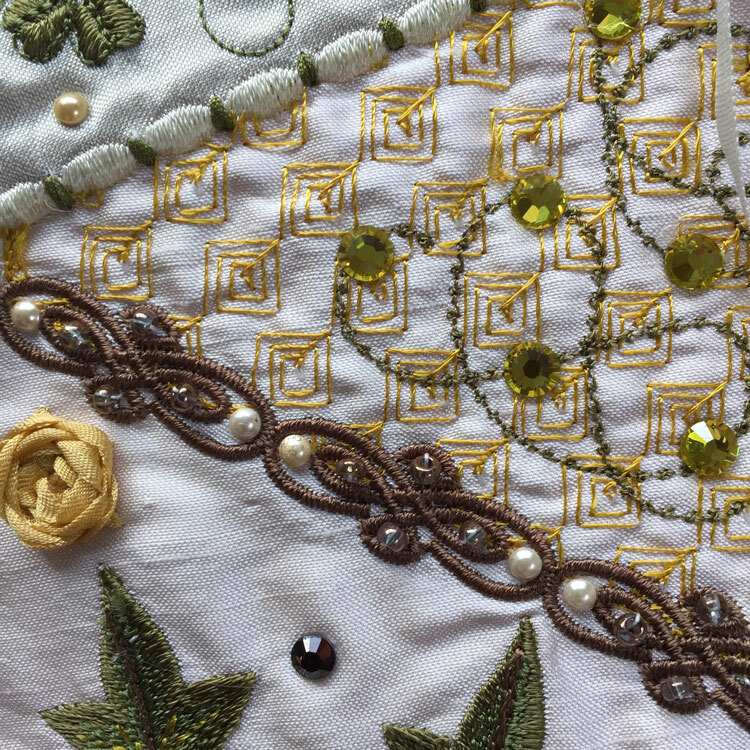 Not much was a required for the right lower block which contains a design from Celtic Grace but I kept the crystals within the design area rather than spreading them all over the gold fabric. 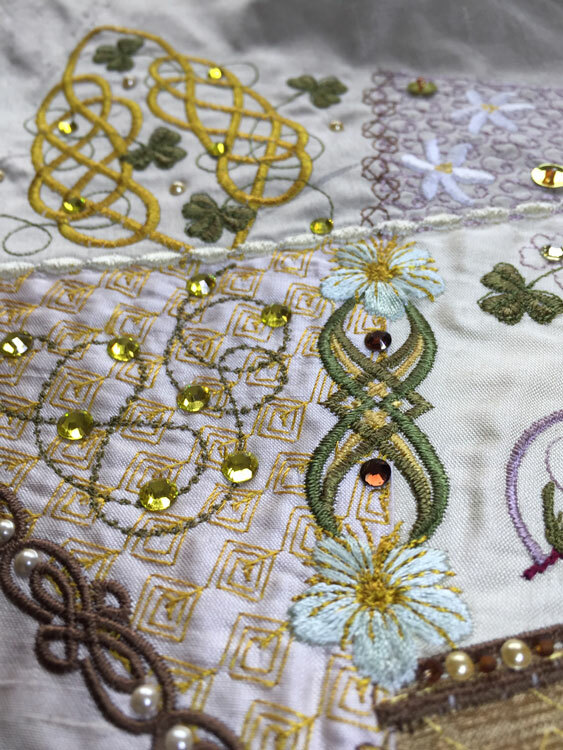 The little border which comes from the Holly Bells collection, below was given a few crystals and some yellow green crystals were added to the left top and middle top areas to highlight the Celtic ribbon work. I wanted to use the green ribbon along with some silk ribbon and some raw silk thread which I discovered at the Festival of Quilts so I used these to create small bows to attach to the block. Until this was done it did not look complete. You can see the overall effect here of all these elements. 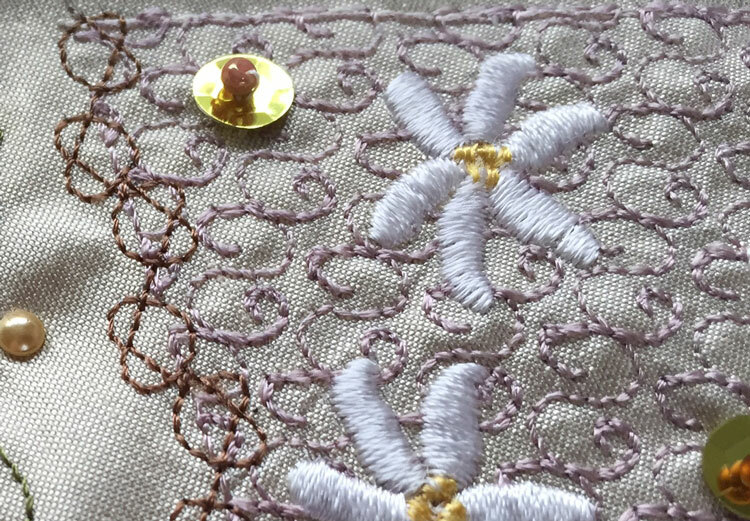 The last stage of embellishing is hand stitching tiny seed beads in place and I selected a few which looked good, including some pale pink ones just to emphasis the pink heather and small pink blossoms. I managed to add some small pink seed beads in the top right section, and stitched some green silk ribbon over the cream ovals that cross over the block. 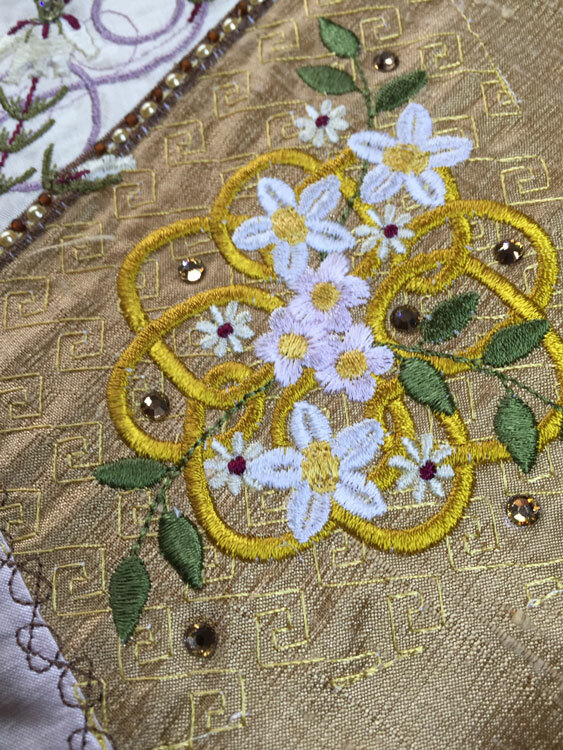 As you can see I attempted a gold silk ribbon rose, then added some tiny brown beads to the Celtic border to fill the gaps. 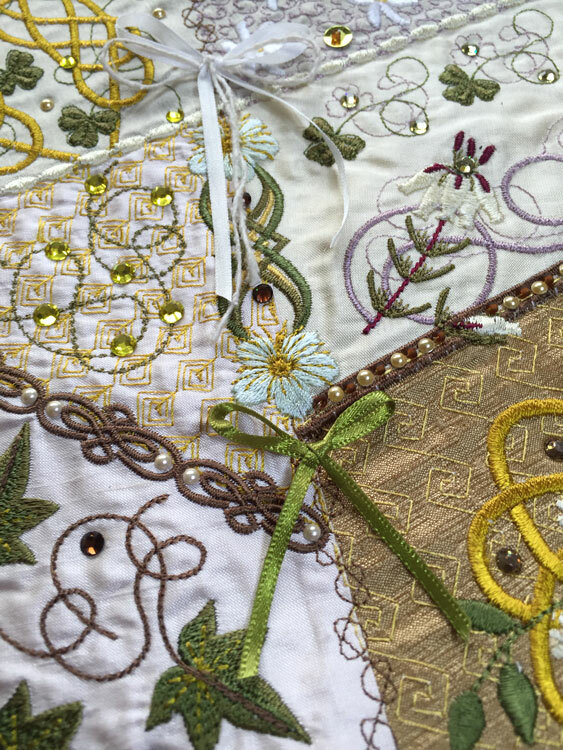 This entry was posted in Discussing machine embroidery, New Designs and tagged Celtic Designs, Crazy quilting, Crystals, embellishing. Bookmark the permalink. Blocks are beautiful with their jewelry on!